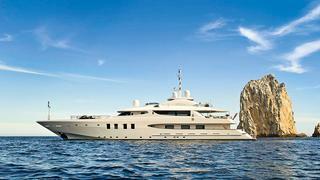 AZTECA II is a distinctly shaped and conspicuously elegant superyacht built into a welded-steel hull of 50 metres. The timeless exterior and interior styling comes from Michael Leach. Charter yacht AZTECA II’s great on board luxury and comfort is the result of combining high quality design with the latest technology with functionality. AZTECA II offers spacious and elegant accommodation for twelve guests in six cabins. The full-beam owner’s suite is located on main deck, while a full-beam VIP suite and four guest’s cabins are located on the lower deck. Classic comforts and details found on board include a piano, bath tubs, separate office and formal dining room. The aft upper deck has a lovely al fresco dining area for 12. The panoramic bridge deck skylounge is a lovely place to escape for an after-dinner nightcap. This state-of-the-art motor yacht is fitted with two 2,250hp Caterpillar engines, generating a cruising speed of about 16 knots. At a more economical speed of 12 knots, she has an impressive range of 5,400 nautical miles. After a refit in 2013, Quantum zero speed stabilisers were added to provide extra comfort whilst underway. She also has a new six-person Jacuzzi on the sun deck, which offers spaces for both soaking up the sun or relaxing in the shade.